The Web's first comprehensive collection of links and resources on contemporary Buddhist women. Female teachers, activists, scholars, nuns, and yoginis (practitioners) may be found on these pages, as well as teachings and special events, projects, organisations, bibliographic and contact information. We also offer a complete guide to the many female meditational deities found in Tibetan Buddhist practice. 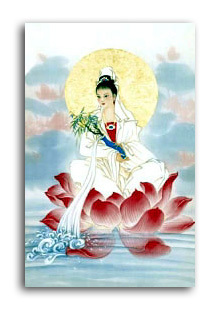 An excellent site for up-to-date information about what is happening for Women in Buddhism. The newsletter of The International Association of Buddhist Women. "The Sakyadhita newsletter welcomes contributions by its readers in the form of articles, letters, drawings, or announcements of interest to Buddhist women, both lay and ordained." In the Archive section of this website: Theravada Buddhist Writings by Women; Women In The Pali Canon; Miscellaneous Facts and Articles. In the Teachers section: Famous Women Vipassana; Teachers; Sister Ayya Khema and Dr. Thynn Thynn and her meditation community. The Tibetan Nuns Project is a non-profit organization dedicated to educating and supporting Tibetan nuns living in exile. Our sponsorship program supports over 500 nuns in five different nunneries in the Himalayan region. Our objectives are: improving the standards of food, sanitation, medical care and basic education and training in existing nunneries; developing an institute that offers nuns innovative educational opportunities; and establishing further facilities for refugee Buddhist nuns. Thösamling means Place for hearing,study and reflection of the Buddhas Teaching. A Non-sectarian Nunnery Following the advice of His Holiness the Dalai Lama, the nunnery will encourage interaction among the four great lineages of Buddhism by welcoming nuns and teachers from each of these lineages. While the teachers we invite will be chosen on the basis of their qualification, a special effort will be made to invite women who have established their credentials as Buddhist teachers and practitioners. Ven. Bhikkhuni Kusuma MA. PhD. is a fully ordained Buddhist Nun from Sri Lanka who has pioneered the re-establishment the Therevada female Buddhist Order in Sri Lanka, 1000 years after the Order died out. She has taken upon herself the task of carrying on the efforts of her mentor, Sister Ayya Khema, in establishing the 'Ayya Khema International Buddhist Mandir'. This establishment will be an abode in Sri Lanka for female seekers of solitude, truth and wisdom through the teachings of the Buddha. Once completed the 'Ayya Khema International Buddhist Mandir' will offer; the study of Pali and Theravada Buddhist Suttras, Abhidhamma Studies, Pali chanting, meditation and English instructions. Comprehensive and up-to-date information about Ven. Thubten Chodron, her Teachings, Dharma Activity Schedules (Dharma Classes, Meditation Retreats, etc), Publications, Book Reviews and other special events. Born in 1950, Ven. Thubten Chodron grew up near Los Angeles. She studied and practiced Buddhism of the Tibetan tradition for many years in India and Nepal. Ven Chodron was a co-organizer of "Life as a Western Buddhist Nun", and took part in the conferences of Western Buddhist teachers with His Holiness the Dalai Lama in 1993 and 1994. She currently lives and teaches in Seattle with Dharma Friendship Foundation and continues to travel worldwide to teach the Dharma. Aranya is a project to develop a retreat centre in Europe for women wishing to be ordained into the Western Buddhist Order. The site includes articles by and about women on motherhood, friendship, dealing with pain; the meaning of ordination in the Western Buddhist Order; our search for land for a retreat centre; forthcoming events, etc. This site, dedicated to feminist interpretations of Buddhist philosophy and practice, is named in honor of the dakini: an important image of female power in Buddhism. An advanced spiritual being, she moves in a fundamental freedom so spacious in its emptiness that it is like the sky, or like space. "Many women must have completed their studies and some must have started temples, but we know very little about the history of women in the Dharma because the translators and historians were mostly men."